Some think that we were lied to prior to the referendum. I think its more a matter of it being a very complex issue. People wanted lower immigration, yet immigration from outside of the EU was just as much of an issue. People felt that the EU was unaccountable, well just look at our lot in Westminster and the House of Commons. I can see the merits of another referendum, but it would in itself be very divisive. We should just get on with leaving, that is what our MPs voted for when they triggered article 50. We need to leave with a deal, Theresa mays deal is rather convoluted, but that is because she wants to end free movement. Although in reality we will end up going back to letting in workers, as we did before, and of course we all want to move around freely for holidays and business. Leaving the EU is and will reduce growth and prosperity, but lets get on with it and then we can get back to higher growth. We need to tackle the issue of increased violence, ill health and poverty, we are still a rich country, inside or outside of the EU. Of the 51 million adults in the UK, only 17,410,742 voted to leave the EU; when the next general election is called, people need to understand that their vote does matter. With the splits in both Labour and Conservative, changes to the electoral system are very much needed. We need to stop this revolving door of left-right politics and adopt a voting system that will allow the smaller parties to flourish. In my childhood I attended Peel Street Junior school, it has recently been sold to developers, its transformation into apartments is looking amazing. I recently walked passed the old 1960s timber prefabricated classroom in the Melbourne Street car park, that was my first classroom after nursery school. The car park is used by local businesses and shoppers. So I was surprised to see a planning application pinned to a telegraph pole for eight houses with gardens. I have read that the Council enjoys rights over the car park, but it has decided in its wisdom to forgo those rights. Leeds City Council informed local councillors, but they raised no objections to losing valuable town center parking. Melbourne Street and Peel Street is busy already with parked cars. The vehicles that once used the college car park and Melbourne Street for parking, will now be forced to use the already well used Annie Street car park and the neighbouring Peel Street and Acroyd Street. One of Morleys best attractions is its ample and free parking. Since the car park has already been sold, perhaps its too late to save it from development? I think its marvellous that we have more houses being built, both the Conservatives and the Labour Party have made big pledges in regard to house building before the last election. There have been various large scale housing developments through-out Leeds. In Scotland the rules were changed in 2005 so that an employee of a local authority could stand for election to that authority, and would only have to resign their employment if they were elected. The Electoral Commission carried out a report for the government in 2015, the report recommended that England should adopt the same qualifying rules for elections as Scotland, and local authority workers should be allowed to stand, but they would have to resign their job with the local authority if elected. The report has not been acted upon yet. In the local elections coming up in May, all our present contingent of councillors will all be up for election. As a local authority worker for Leeds City Council, myself and all my 14,632 colleagues are disqualified from standing for election. Disqualifying almost 15,000 people from standing for election seems quite bizarre to me, not many people are interested in politics, the bigger the pool to choose from, the better. The turnout in my electoral ward in 2016, Morley South was 30.8%, a sad reflection on how people feel about politics. In the English local elections of 2016, in some areas fewer than one in five eligible voters went to their local polling station to cast a vote, raising fears of a broken system. The turnout in the 2012 Scottish local elections was 39.6%, and in 2017 local elections turnout was 46.9% Some people might already be aware of the differences between England and Scotland. Scotland have no tuition fees, no prescription charges, its own Parliament and the Scottish Parliament also has Proportional representation(PR). The Scottish government have also been praised for progress made on children’s health in 2017, they made better progress than England and Wales. The Electoral Commission carried out a report for the government in 2015, the report recommended that England should adopt the same qualifying rules for elections as Scotland, and local authority workers should be allowed to stand, but they would have to resign their job with the local authority if elected. The report has not been acted upon yet. The Conservative gave the DUP £1 billion so that they can get bills through Parliament, but very little few bills are being processed. I believe that Scotland have a better democracy than England, we to catch up. The Crown Prosecution Service is expected to announce before the General election in June whether around 30 Tory MPs will be criminally charged over the alleged 2015 election expenses scandal. The Conservative Government has also broken a legal deadline to announce any changes to the state pension age, leaving millions of older voters in the dark about their future pensions. The Government is legally mandated to review the state pension age by May 7th, as set out in the 2014 Pensions Act. The Cridland review recommended scrapping the triple-lock pension, which guarantees a minimum annual rise to the state pension by 2.5 per cent. It also recommended raising the state pension age from 67 to 68 between 2037 and 2039, which would affect almost 6 million people. For people who are younger than 30, they might find themselves working until the age of 70. Our Conservative Government are a bunch of self-serving crooks. They tell the electorate as little as possible; retiring at 70 will not be in the Conservative manifesto, not a chance, but it will happen. The campaign group Transparency International, whose head of UK advocacy and research Rachel Davies has said: “It’s absolutely true that the UK is one of the leading financial centres for the laundering of corrupt money from overseas, whether through the property market, luxury goods or other sectors”. It was interesting that my MP, asked the Secretary of State for Health, what the average employer pension contribution is for a junior doctor. The written answer that she received was that junior doctors are at the bottom of the pile, when it comes to employer contributions. I am not sure if her intension was to highlight the plight of junior doctors under this Government. Our NHS seems to be out of the media spotlight, now that Brexit and Grammar schools are under the media spotlight. The performance of our local NHS trusts is well below standard. The long-term trend is one of missed targets, with emergency admissions up 3.8%, diagnostic tests up 6.1% and consultant-led treatment up 4.2%. A&E attendances are up 4.1%. The NHS is a wonderful organisation, but it seems that we are getting more emergency treatment. Is this because we are less healthy and general practitioners are failing to respond due to lower budgets? After the tidal surge that hit the East coast the Environment Agency said 800,000 homes in England had been protected by flood defences and better forecasting had given people “vital time” to prepare. When David Cameron came into office they cut millions of funding for sea defences. In 2011 flood defence funding was cut by 8%. The effects of climate change are not being taken seriously by this Government. Since the last tidal surge of 1953, sea levels are around 6 inches higher. In 2005 Hurricane Katrina and the associated tidal surge that accompanied it killed more than 1800 people. The effects of Climate change was predicted to bring more precipitation and more severe weather conditions, but yet few are linking last weeks tidal surge to climate change, despite it being Dover and Kents’ highest recorded sea level in more than 100 years. 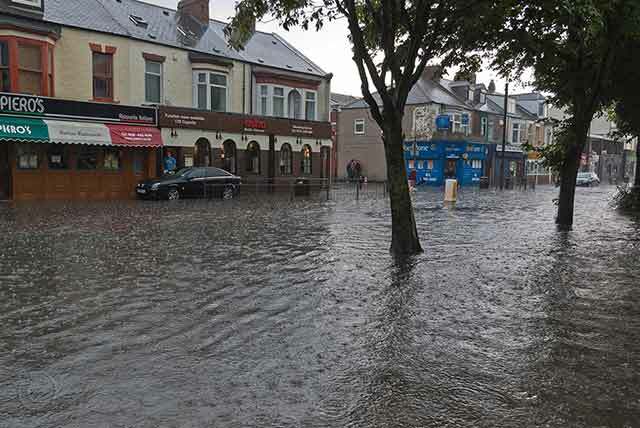 Insurers are bracing themselves for new claims over damage to homes and businesses, just two months after storms in southern England led to payouts of over £100 million. Our Government needs to wake up, instead of funding the Arts Council and other such organisations, they should put more money into coastal and flood defences.